Penn’s Eta chapter was established on 1 January 1849; the national fraternity was founded in 1827 at Union College in Schenectady, New York. The Eta chapter flourished at Penn for two decades, but in 1872 the undergraduate yearbook, The Record, noted that the chapter had disbanded in 1871. A page dedicated to Delta Phi re-appeared in The Record of 1882 with the following annotation: “Established January 1, 1849. Re-established March 3, 1882.” Penn’s Eta chapter has remained in continuous existence since 1882. Kappa Alpha (1825), Sigma Phi (1827), and Delta Phi (1827) together made up the “Union Triad,” the three oldest Greek letter fraternities in American colleges. Delta Phi was the first of these to establish a chapter at Penn. Penn’s Eta chapter was Delta Phi’s seventh, following Union (1827), Brown (1838), NYU (1841), Columbia (1842), Rutgers (1845), and Harvard (1845). Will J. Maxwell’s 1899 compilation, Greek Letter Men of Philadelphia (1899) stated that five College students were the founders of the Eta chapter. They were James Larrabee Appley (A.B. 1849); two brothers, Henry James Feltus (Class of 1850, non-grad.) and William James Feltus (A.B. 1849), Jesse Shenton Zane Sellers (A.B. 1849; M.D. 1852), and William Hembel Taggart (A.B. 1849, M.D. 1852). 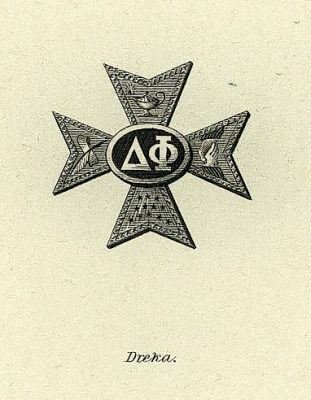 In 1907 the national Delta Phi organization commissioned the production of a definitive account of the fraternity and Arthur G. Freeland edited the 615-page Delta Phi Catalogue, 1827-1907. Freeland confirmed the names of the five organizers of Penn’s Eta chapter and also documented the Eta chapter’s roster of members, which included fifteen initiates in 1849, five in 1850, five in 1851, and seven in 1852. Penn’s Biographical Catalogue of the Matriculates of the College (1894) shows that fully thirty two of these thirty seven students completed the undergraduate course and earned the degree of Bachelor of Arts. This was at a time when the average graduation rate at Penn was only sixty-five percent. An in-depth analysis would be needed to prove or disprove the point, but it appears that in its first decade, the Eta chapter conferred a clear advantage upon its members in their pursuit of the bachelor’s degree. The 1860s, however, were not good years for Delta Phi or for fraternity life in general. The Civil War took some members away and afterwards, the Southerners did not return to colleges and universities in the North. By the close of the decade the Eta chapter had declined to just a handful of members and in 1871 it disbanded. There were no elections to membership for a full decade, but when a group of students organized themselves in 1882 and proposed to re-establish they quickly succeeded. George Herbert Condict (Class of 1883), Charles Nathaniel Davis (Class of 1884; M.D. 1889), Augustus Theodore Dobson (M.D. 1882), William Howard Falkner (A.B. 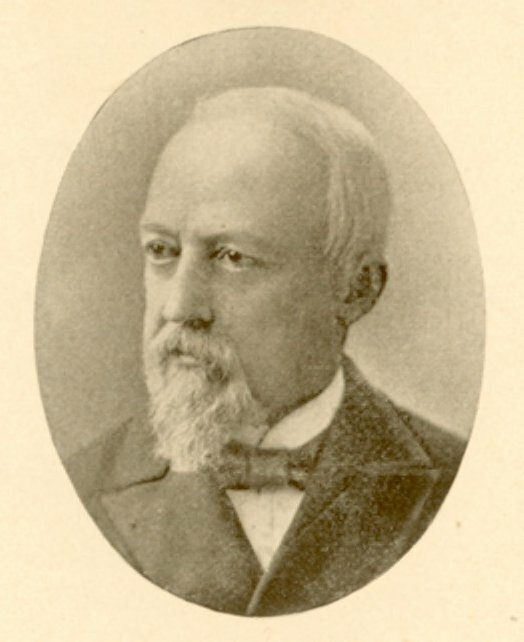 1883), William Constantine Goodell (Class of 1884; M.D. 1885), Louis Jeremiah Cunningham Kimmell (Class of 1883; M.D. 1887), Joseph Campbell Lancaster (A.B. 1882; LL.B. 1884), William Reynolds Lincoln (Class of 1884; M.D. 1888), John Gummere Marsh (Class of 1884), Edward Records, Jr. (Class of 1884), Paul Judd Sartain (A.B. 1883; M.D. 1886), Llewellyn Randolph Snowden, William Lukens Supplee (Class of 1884), Harry D. Thompson, M.D., Milton Cooper Work (A.B. 1884; LL.B. 1887). Delta Phi was the first fraternity to design and construct its own purpose-built house in West Philadelphia. The Eta chapter acquired an ideal site – 3453 Woodland Avenue – directly opposite College Hall. They finalized their plans and began to build in 1898. It was in the midst of construction in 1898, when Maxwell’s Greek Letter Men went to press. Maxwell’s book contains an architect’s rendering of the new club house. 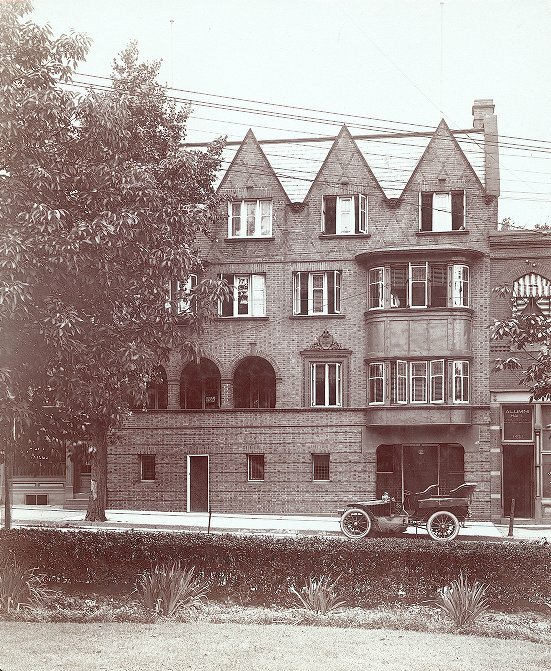 In 1898, while the new building was under construction, the Eta chapter rented a house at 3445 Walnut Street. Eta’s impressive, new house stood at 3453 Woodland Avenue, directly opposite College Hall. George E. Nitzsche, in his University of Pennsylvania: Its History, Traditions, Buildings and Memorials, Fifth Edition (1914), stated that the building was “constructed of hard burnt brick,” four stories high, and notable for “a small, open loggia” on the second floor. Occupied by 1904, when the address was printed in The Record. Delta Phi remained at that location for sixty years, until Woodland Avenue was closed and land was cleared to make way for Van Pelt Library. Professors David B. Brownlee and George E. Thomas, in their co-authored volume, Building America’s First University (2000), stated that the architectural firm of Wright, Andrade, and Amenta designed Delta Phi’s new house in 1959 in a style they describe as “a genteel compromise with modernism.” Delta Phi and the University jointly agreed that the new house would be built at 3647 Locust Walk and the Eta chapter moved to that site in 1960. The 1940 edition of The Record contained brief histories of all of Penn’s fraternities and sororities. Delta Phi’s account claims, correctly, that it was the first fraternity at Penn. It also mentions the St. Elmo Club of Philadelphia, which served as the graduate organization of the fraternity and a quarterly magazine, “Delta Phi Record,” published by the national society, which served to keep members in touch with the fraternity and one another. In 1980 Delta Phi became the first (and only) co-ed fraternity at Penn and in 1997 it described itself as a “literary” fraternity.